Summary: In this Olivet Discourse, when Christ speaks of his coming, he is referring to his return to the earth to establish his kingdom. The first question, “Tell us, when will these things be?”—when one stone shall not be left upon another, is not answered in the Gospel of Mathew. We find it in the Gospel of Luke, and we find segments of it in the Gospel of Mark. Why is it not included in Matthew’s gospel? Because Mathew is the gospel of the kingdom, it presents the King. The destruction of Jerusalem in A.D. 70 has something to do with this age in which we live, but it has nothing to do with the distant future when the King is coming. Therefore, Matthew does not carry that part of the Olivet Discourse. Let’s look at our Lord’s answer to the first question, as recorded in Like’s gospel: “But when you see Jerusalem surrounded by armies, then know that its desolation is near. Then let those who are in Judea flee to the mountains, let those who are in the midst of her depart, and let not those who are in the country enter her. For these are the days of vengeance, that all things which are written may be fulfilled. But woe to those who are pregnant and to those who are nursing babies in those days! For there will be great distress in the land and wrath upon this people. And they will fall by the edge of the sword, and be led away captive into all nations. And Jerusalem will be trampled by Gentiles until the times of the Gentiles are fulfilled” (Luke 21:20-24). Undoubtedly, many of those who heard the Lord Jesus say these things were present in A.D. 70 when the Roman armies surrounded the city, laid siege to it, cut it off from the rest of the world, then finally breached the wall and got in. What the Romans did was terrible. They demolished the city. It was the worst destruction in its history, more devastating than that conducted by Nebuchadnezzar over six centuries earlier. When the Romans destroyed Jerusalem in A.D. 70, the first part of the Olivet Discourse was fulfilled. The next two questions asked by the disciples were these: “And what will be the sign of Your coming, and of the end of the age?” Lord is going to answer the disciples’ questions in their chronological order. He will answer their last question first and the second question last. The first thing the Lord deals with is the sign of the end of the world, or more accurately, the end of the age. The world will never end. The old world will pass away and a new era will be brought on the scene. It will be similar to trading in your old car for a new one. You do not say, “This is the end of the car-age for me. I don’t have a car any more.” You do have a car, because you traded in your old one and got a new one. And the Lord is going to trade the old world in for a new one. The world will never end. But it will be the end of an age, and that is the word the disciples are using in their question to the Lord Jesus. In this Olivet Discourse, when Christ speaks of his coming, he is referring to his return to the earth to establish his kingdom. The church is not in the picture at all. In fact, by the end of the age, the church will have been removed, and it will be the last days of the nation Israel. He is speaking about the Great Tribulation Period and so that is what He labels it in this discourse. The latter part of verse 24 is a remarkable prophecy that the ancient city of Jerusalem would be subject to Gentile rule from that time until the times of the Gentiles are fulfilled. It does not mean that the Jews might not control it for brief periods; the thought is that it would be continually subject to Gentile invasion and interference until the times of the Gentiles are fulfilled. The NT? distinguishes between the riches of the Gentiles, the fullness of the Gentiles, and the times of the Gentiles. 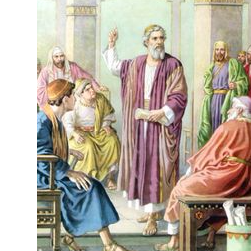 The riches of the Gentiles (Rom. 11:12) refers to the place of privilege which the Gentiles enjoy at the present time while Israel is temporarily set aside by God. The fullness of the Gentiles (Rom. 11:25) is the time of the Rapture, when Christ’s Gentile bride will be completed and taken from the earth and when God will resume His dealings with Israel. The times of the Gentiles (Luke 21:24) really began with the Babylonian captivity, 521 b.c., and will extend to the time when Gentile nations will no longer assert control over the city of Jerusalem. In this Olivet Discourse, when Christ speaks of his coming, he is referring to his return to the earth to establish his kingdom.